Cornhusker Boys’ State is held annually during the summer before the senior year of high school, typically during the first week in June, on the main campus of the University of Nebraska in Lincoln. The most important thing to understand about applying to attend Cornhusker Boys’ State, is that the process is decentralized. In other words, the program does not directly receive applications from interested individuals. 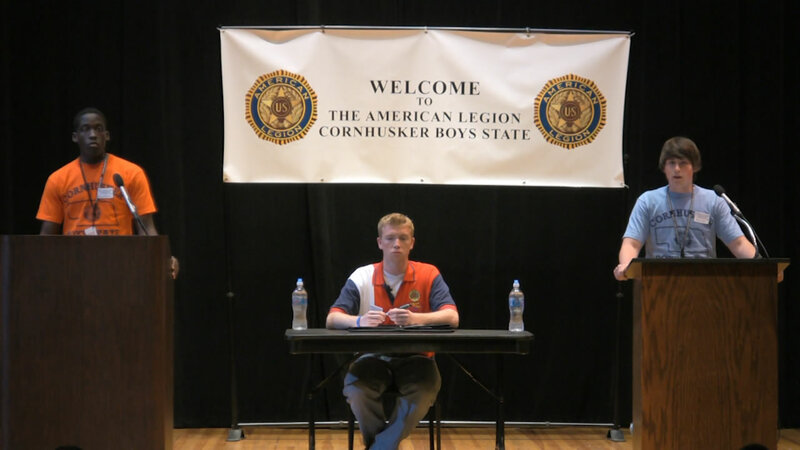 Rather, selection to attend Cornhusker Boys’ State generally requires the endorsement of a local American Legion Post, which is typically responsible for devising the fundraising mechanism by which the attendance fee shall be covered. Most importantly, the local Legion Posts help to ensure that only the most qualified applicants are selected to attend. On Our Stage Appear Senators, Governors, Justices of the NE Supreme Court, CEOs, Head Coaches… and Future Cornhusker Boys’ State Governors. Applications for Cornhusker Boys’ State are typically mailed to all American Legion Posts in the State of Nebraska in early February. There is no enrollment quota for selection to attend, and each Post may sponsor as many qualified candidates as they see fit. It is encouraged that every Nebraska high school be represented, as well as home-school students. Any boy meeting the following standards who is a member of the junior class in an accredited high school during the respective academic year, and who is a Nebraska resident, is eligible to be considered for selection to Cornhusker Boys’ State: (a) preferably in the upper half of their class scholastically; (b) stand well in school citizenship; (c) have leadership qualities, and (d) are in good health. Sponsors are requested to note that Cornhusker Boys’ State is not a disciplinary or recreational camp. Only candidates with outstanding qualifications in character, service and leadership, who will have a serious attitude toward an intensive citizenship training program should be selected. It is strongly urged that no publicity be given regarding a sponsor’s selection of a candidate until after the acceptance of the application by the Board of Directors is received by the sponsor. The Board of Directors reserves the right to accept or reject any application for membership in Cornhusker Boys’ State. After the session is in progress, the staff may dismiss any member for violation of the rules of Boys’ State. If you are interested in attending, the best local points-of-contact are your local Legion Post; and your high school principal, guidance counselor, and government teacher. In order to help locate an American Legion Post in your area, you may wish to use the Post Locator. For additional assistance in identifying a local point-of-contact, you may contact Legion Headquarters in Lincoln regarding the Cornhusker Boys’ State program: Dave Salak, Department Adjutant, 402-464-6338. It is the responsibility of each individual Post to establish its own endorsement process and timeline. Although the application process at each Post is likely to include additional requirements (e.g. essay and interview), information relayed to headquarters in Lincoln includes the Application for Cornhusker Boys’ State. Additional details may be found in the CBS Informational Brochure. As a rough guideline regarding application deadlines, please note that local Posts must notify Legion Headquarters of their endorsement decisions not later than March 15.